To assess whether intensive care units within Scotland are screening for delirium on a daily basis and to test awareness of the current methods used for screening. This was a national survey of all 23 adult intensive care units in Scotland, via telephone over the course of one day. Nursing or medical staff in each unit, familiar with local policy were questioned to ensure validity of survey responses. Each unit was asked whether they screen for delirium on a daily basis and if they were aware of any screening tools used for delirium. Those units who screened for delirium daily were asked which screening methods they used (CAM-ICU or ICDSC) and whether nursing/medical staff or a combination carried this out primarily. 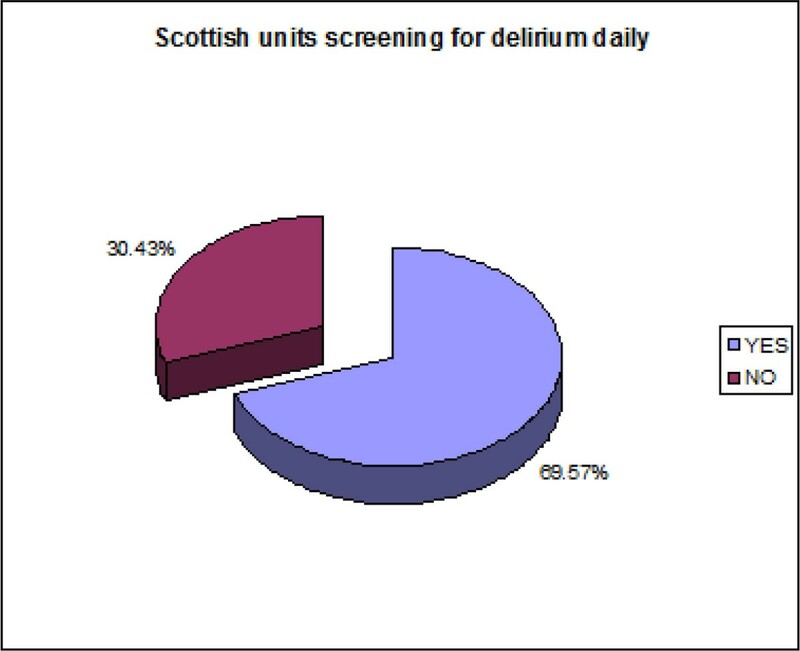 When asked 16 out of the 23 (69.57%) units in Scotland stated they screened for delirium on a daily basis. Screening was done primarily by the nursing staff in 50% (8) of these units, with the other 25% by doctors and 25% both medical and nursing staff. Of the 91.3% of units aware of recommended screening tools for delirium, all stated that they used the CAM-ICU screen. Daily screening for delirium using either CAM-ICU or ICDSC is the gold standard for early identification of a patient with delirium. Increased awareness of delirium through screening allows a prompt assessment of causes and a more sensitive holistic and pharmacological patient management plan to limit morbidity and mortality. In general, intensive care units in Scotland are screening for delirium daily and have a good awareness of the methods used to screen for delirium. Scottish units screening for delirium.